The Social, Cultural, Educational and Services Committee of the of the Roosevelt Island Residents Association invites you to its 3rd Annual Cherry Blossom Festival, a celebration of Japanese culture. 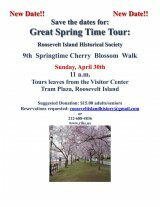 At 11:00 a.mm., Sunday, April 30th, historian Judy Berdy leads an informative walk in coordination with the Cherry Blossom Festival. 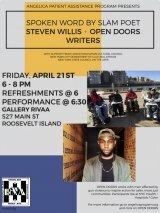 On Friday evening, April 21st at 6:00 p.m., celebrated spoken word poet Steven Willis treats the Roosevelt Island community to his work and his local students in the Open Doors program at Gallery RIVAA. Admission is free. Today, Last Chance to See "Almost Maine"
For four shows in three days, Roosevelt Island becomes Almost Maine, "a town that’s so far north, it’s almost not in the United States—it’s almost in Canada. And it almost doesn’t exist," according the website of this extraordinary, popular play. 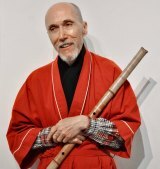 Mid-afternoon during Roosevelt Island's annual Cherry Blossom Festival finds Gerald Starlight's shakuhachi lifting meditative tones in two performances. On Saturday, April 15th, RIVAA artist Ioan Popoiu opens a show of new work, The Phantom of the Holographic Wakes at the 527 Main Street Gallery. 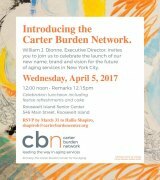 You are also invited to a public opening reception on April 22nd from 6:00 to 9:00 p.m.
On April 5th, at noon, the Carter Burden Network hosts a celebration of its successful expansion and new name at the Roosevelt Island Senior Center, 546 Main Street. 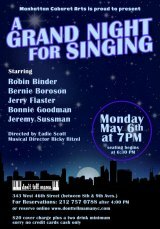 Directed by Jackie Lucid-Cusick, Sondheim On Sondheim is Main Street Theatre & Dance Alliance's big musical event, coming up this weekend. Get Tickets Here. RIOC and RIVAA jointly announced the Opening of Motorgate Gallery 2017, from 6:00 to 8:00 p.m. on March 29th. 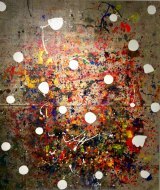 Public is invited for art, live jazz and refreshments. See a related article here.